News 10/5/07 More details have been released on the Marriott Marquis. The resort will have 3,500 rooms, 500,000 square feet of meeting space and (drum-roll please) a casino. No mention was made as to the fate of the three existing Marriott hotels on the property. I assume the Courtyard and Residence Inn are doomed, while the Marriott Suites could remain. Time will tell. Construction is expected to begin in the Fall of 2008 with completion slated for the second quarter of 2011. News 8/15/07 Marriott has been busy buying up the rest of the block where three of their hotels now reside. 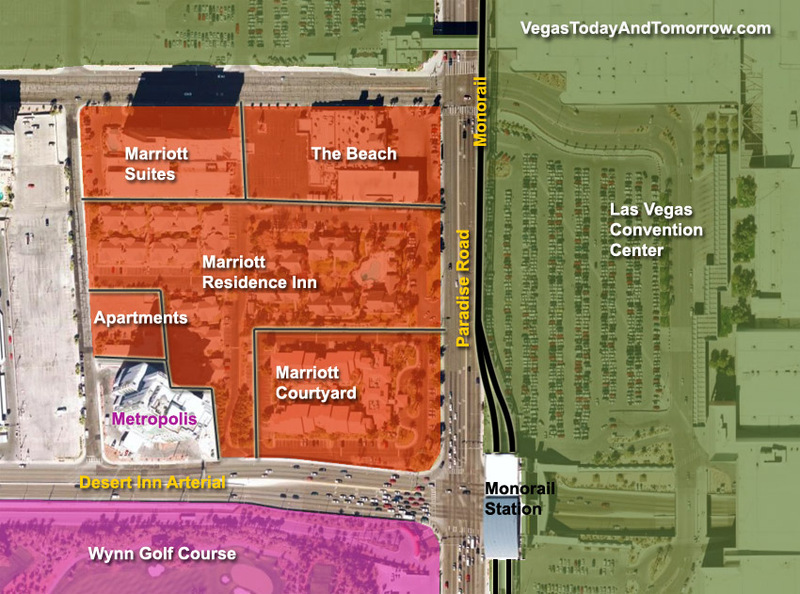 Marriott now owns that whole block (except Metropolis), that's 16 contiguous acres. They purchased the previously leased land (under their existing hotels) as well as the land where The Beach casino lived and a small vacant apartment complex on Debbie Reynolds Dr. The most recent purchase was 10.6 acres under the Residence Inn and Courtyard for $186 million ($17.5 million per acre). Marriott plans to work again with Lewis Shaw (the developer that built their nearby Renaissance hotel) to build Marriott Marquis Las Vegas on the land. This would most likely mean that their Courtyard and Residence Inn properties would be leveled. 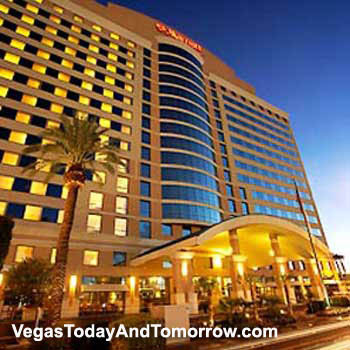 We don't yet know if the (10-year-old, 15-story) Marriott Suites hotel will stay or go, but this is Las Vegas and newer hotels than that have been imploded. This is a prime spot for a major convention-based hotel. A quick walk to the Las Vegas Convention Center and monorail station, and whatever Wynn does with his golf course when he redevelops it. New York and Atlanta host the other two Marriott Marquis. 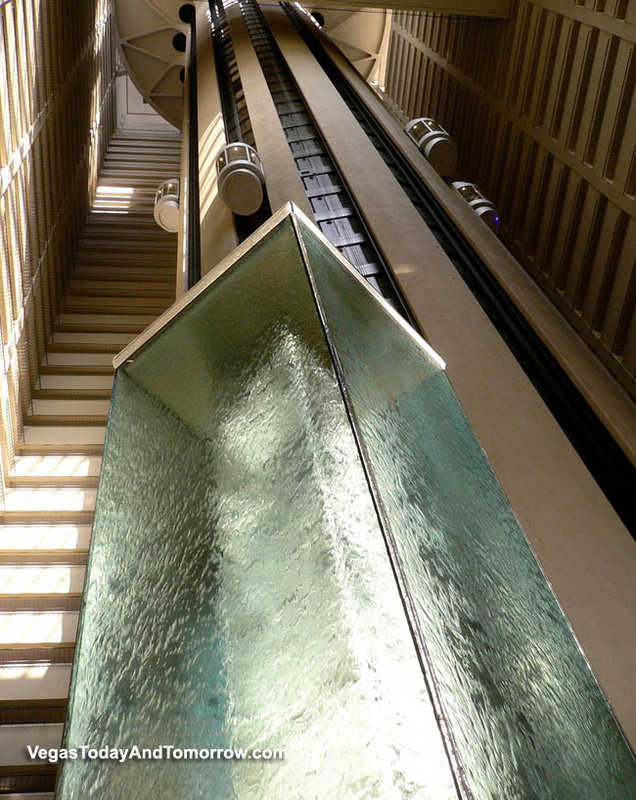 Marriott's Marquis brand are high-end, high-rise properties with dramatic open (full height) atrium lobbies. We can hope this is what's coming to Vegas. Stay tuned for more news as details are released. 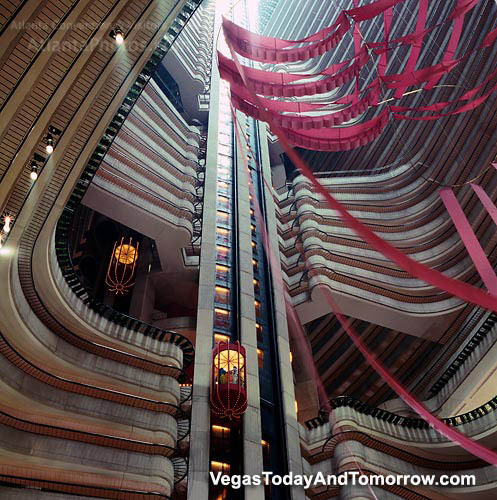 The lobbies of the Marriott Marquis in New York (far left) and Atlanta (left) have open, sweeping atriums. We'll need to wait to find out.